The next few blogs will be on the bridges over Lagunitas Creek. At Point Reyes Station, Highway 1 crosses over Lagunitas Creek on an old pony truss bridge (27 0023). This has been a place to cross the creek since the Coast Miwoks lived in the area. 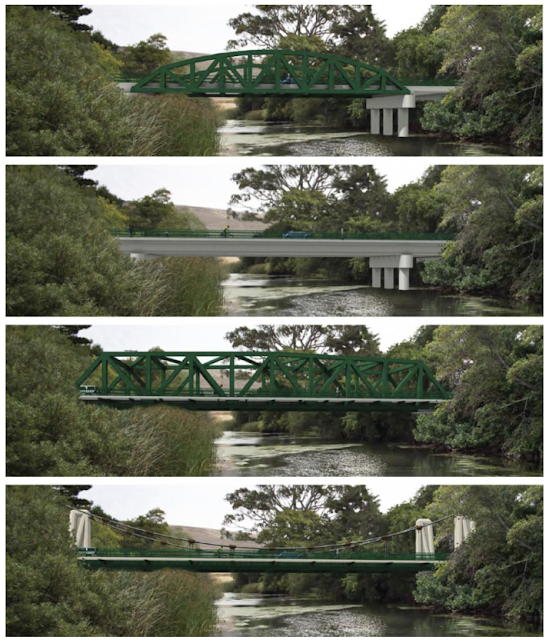 The current bridge includes a 100 ft long steel truss span and two 25 ft long slab approach spans. 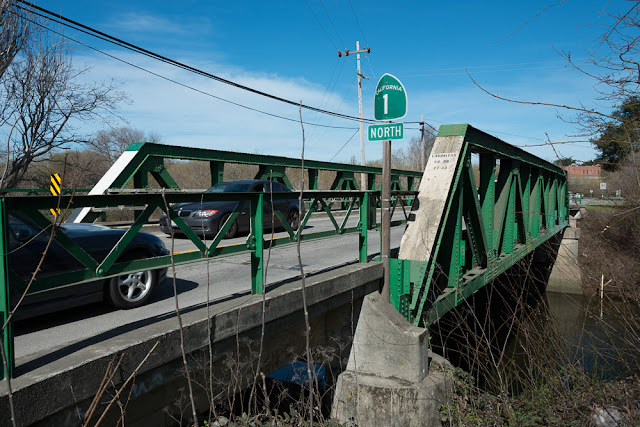 The bridge was built in 1929, it's a few hundred yards from the San Andreas Fault, and Caltrans is planning to replace it with one of the bridges shown below. The existing bridge is called the 'Green Bridge' and so the replacements all have green paint on them, at least for the railings. The third and forth alternative are the only ones that don't include piers in the creek, which may make one of them the winner with the various government agencies who will need to approve this project. The residents of Point Reyes Station also have a say in the bridge replacement, which has evoked strong emotions. A series of meetings have been held so that everyone hcan express there opinion on the project. A temporary bridge will be used while the old bridge is being replaced. Marin County, California Bridges: State Route 1 (Green Bridge) across Lagunitas Creek by Mark Yashinsky is licensed under a Creative Commons Attribution-NonCommercial-NoDerivatives 4.0 International License.